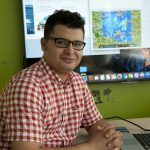 Abdellah Ichiba is a Research Associate Professor at HM&Co lab of École des Ponts ParisTech, He’s responsible for hydrological modeling axis and the development of Multi-Hydro platform. He has a PhD in Hydrology from Paris-Est University, a Master degree from École des Ponts and an Engineer degree in Hydraulics from École Hassania des Travaux Publics. His area of expertise covers Hydrology/Hydraulic, Radar forecasting, Flood management and Hydrological modeling with much more focus on the use of radar data for real time flood management in urban areas and the improvement of hydrological modeling approaches. His research activities were involved in multiple large scale European projects with interaction of partners from multiple horizons (local authorities, research institutions, private companies, …) and leaded to several publications in international journals. Ichiba A. et al., 2017 : “Multifractal comparison of two operational radar rainfall products”, Journal of Hydrology (submitted). Gires A., Tchiguirinskaia I., Schertzer D., Ochoa Rodriguez S., Willems P., Ichiba A., Wang L.-P., Pina R. D., Bruni G., Tuyls D. M., ten Veldhuis M.-C., 2017 : “Fractal analysis of urban catchments and their representation in semi-distributed models : imperviousness and sewer system”, Hydrology and Earth System Sciences (HESS), hess-2016-527 (accepted). Ichiba A. et al., 2017 : “Scale effect challenges in urban hydrology highlighted with a Distributed Hydrological Model”, Hydrology and Earth System Sciences (HESS) (under minor revision). Ochoa-Rodriguez, S., Wang L.-P., Gires A., Pina R. D., Reinoso-Rondinel R., Bruni G., Ichiba A., et al., 2017 : “Impact of spatial and temporal resolution of rainfall inputs on urban hydrodynamic modelling outputs : A multi-catchment investigation”, Journal of Hydrology, Volume 531, Part 2, December 2015, Pages 389-407, ISSN 0022-1694, http ://dx.doi.org/10.1016/j.jhydrol.2015.05.035. Official deposit of Multi-Hydro model v 2.1 with the French Programs Protection Agency, IDDN FR 001 340017 000 S C 2015 0000 31235. Participation to more than 10 scientifique conferences, including EGU, JDHU (Journées Doctorales en Hydrologie Urbaine) and ICUD (International Conference on Urban Drainage). I. Paz, E. Skouri-Plakali, J. Lee, A. Ichiba, A. Gires, I. Tchiguirinskaia and D. Schertzer, 2016 : “Analyse des produits radar et modélisation hydrologique. Rapport d’expertise concernant la gestion du risque inondation au bassin de la Bièvre-SIAVB”, Véolia, 176 pp. A. Giangola – Murzyn, J. Richard, A. Ichiba, A. Gires, I. Tchiguirinskaia et D. Schertzer, 2012 : “Modélisation et paramétrisation hydrologique de la ville, résilience aux inondations”. Ministère de l’Écologie, du dévelopement durable et de l’Énergie. 17 pp.